Betty Ione Hazelwood, long-time resident of Chariton, died of heart failure February 7 at Ramsey Village, Des Moines. She was preceded in death by her husband, Robert Hazelwood, and sisters, Gwenith (Fred) Pfeiffer, Janet (Doc) Johnson, and Benita (Tony) Osmundson. Surviving siblings are Nedra (Jack) Ward and Russell (Marcia) Jones of Lake Crystal, MN. 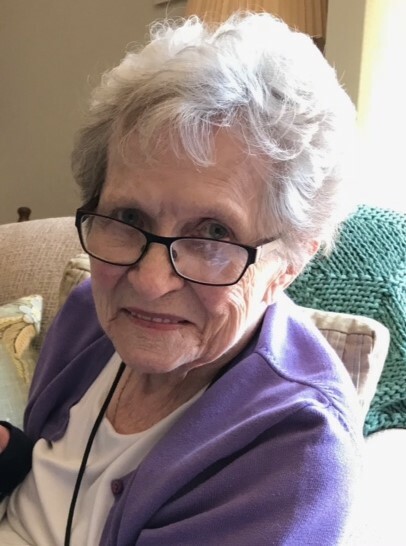 Family members to mourn her passing are daughters Ann Blevins (Michael Adams), Des Moines; and Kay Wright, Des Moines; and son, James Hazelwood, Birmingham, AL; grandchildren Eric Powers, Albia; Michael Blevins (Katie Slauson-Blevins), Norfolk, VA; Susan (Nathan) Hannam, Adel; Jeremy Wright, Des Moines; Margeaux (Josh) Spain, West Des Moines; and Henry Adams, Las Vegas, NV. Betty will also be missed by her great-grandchildren and great-great-grandchildren, Jacqueline (Adam) Smith; Jordyn (Cameron) Huett; Jerod (Sophie) Wright; Grant and Clair Powers; Raegan, Emma, Colin and Stella Blevins; Reid Hannam; Wyatt and Karsyn Smith; Coy Huett; Cyrus Wright; and Jersey Durham. Betty was born October 3, 1928 in Lake Crystal, Minnesota, where her parents, Amilda and Benjamin Jones, farmed crops. She was the first of five Jones children. She attended a one-room country school during grade school and during her high school years her parents rented a room in a boarding house in Lake Crystal. During her school years, Betty enjoyed reading and business courses. Upon graduation, Betty completed business courses at Mankato School of Business, where she received several awards for outstanding coursework. Betty and Robert married on May 6, 1953, moved to Chariton after a brief stint in Des Moines and both remained lifelong residents of Lucas County. Betty served customers for many years at First State Bank. She was an avid bridge player, an active member of First United Methodist Church and PEO. She was also active in the Lucas County Democratic Party and a supporter of the Humane Society of Lucas County. The phrase “If you can’t say something nice about someone, don’t say anything at all,” reflected Betty’s personality. She found the good in everyone and was described by all who knew her as gracious and compassionate.